Migration is hard on a songbird. It has a commute of thousands of miles—north or south, depending on the season—a journey that often includes a nonstop flight over the Gulf of Mexico or even along nearly the entire coastline of North and South America. Evolution has equipped migratory birds with the physical characteristics necessary to make the long trips. But evolution almost never supplies a surplus and Dan Cristol says a successful migration is usually a chancy proposition for individual birds. Cristol, a professor in William & Mary's Department of Biology, is one of the authors of a new paper that confirms an additional challenge for migratory birds, beyond the vicissitudes of weather, predators and the bad luck of running into a wind turbine or a window. The paper, "Mobilization of mercury from lean tissues during simulated migratory fasting in a model songbird," shows that birds that have ingested mercury get a surge of the neurotoxin when subjected to conditions similar to what they experience during migration. The paper was published in Scientific Reports, a peer-reviewed journal in the prestigious Nature Publishing Group. Cristol's co-authors on the paper are Alexander Gerson of the University of Massachusetts, Amherst, and Chad L. Seewagen of Great Hollow Nature Preserve and the environmental consulting firm AKRF. Cristol and his co-authors used domestic zebra finches to model conditions of migration on songbirds. It is the latest in more than a dozen papers addressing effects of mercury on songbirds through a series of controlled studies using zebra finches as models. "Each paper asks a completely different question," Cristol said. "For example, one is about whether mercury affects the immune system. Another is about whether it affects singing behavior. This one is about whether mercury levels might surge during migration." The answer is, yes, they do. Cristol and his colleagues found that migration-like physical stress flushes accumulated mercury back into the bloodstream of birds. He explained that birds, like other living things, ingest mercury from various sources of environmental contaminants. Bacteria change the chemistry of environmental mercury through a process called methylation. It's the methylated mercury that is really toxic, he noted. When birds go without food, as they do during migration, they start metabolizing their own proteins, Cristol explained. "That's a normal process during migration: You use up all your fat storage, then you start 'digesting' the very muscles that help you fly," he said. Methylmercury has a chemical affinity to bind with muscles and protein, he added, and a bird arriving at its destination has typically metabolized a significant portion of its muscle tissue. "And you end up releasing the mercury that you've stored in your muscle tissue back into the bloodstream all at once," Cristol said. The blood-borne mercury inevitably finds its way to the bird's brain. The effects of the emancipated neurotoxin are unknown, but Cristol has some ideas. For one thing, the mercury could affect a bird's navigational abilities, causing it to get lost. It's also possible that a bird could arrive famished and in need of immediate replenishment, but so mercury-muddled that it just doesn't think to eat. 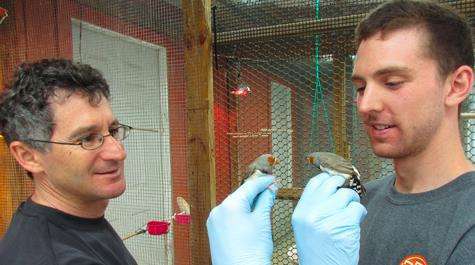 The zebra finch studies were conducted in William & Mary's aviary facilities. Dosed birds were subjected to a short fast, what Cristol called "a simulation of a very mild migration." Some birds also were exercised, placed in a hamster-wheel like treadmill device. Birds that fasted and/or exercised showed markedly higher blood levels of mercury than a control group that did not fast. The higher mercury levels were right in line with the decrease in the birds' lean mass, measured in a truck mounted MRI unit in the aviary parking lot. Cristol began the finch studies after studying effects of mercury on birds, particularly in the area near Waynesboro, Virginia, on the South River. The area was hit hard by industrial mercury pollution and he receives funding for his investigation from E.I. DuPont de Nemours and Co.
"Mercury is a neurotoxin and we've found that it profoundly affects the birds' ability to remember," Cristol explained. "In the field, birds have to remember where their nest was. They also have to remember where their food was yesterday, because it's probably going to be in the same place today." The research in the Scientific Reports paper has serious implications for migrating birds. Zebra finches are natives of Australia and Cristol says that in addition to being a mainstay in the pet-store trade, decades of domestication have made the birds an ideal passerine model for research. "Their genome has even been completely sequenced," Cristol said, adding that the finches are revealing secrets that would be impossible for scientists to obtain from birds in the wild. "We thought the controlled studies were kind of like a check on what we find in the field. In the field, it's all correlational. These aviary studies let us show that there's actually cause and effect with the mercury," he said. "What we really want to do is to find out the main areas in which mercury affects this model songbird species that can be applied to the wild populations. And how much mercury it takes to cause a problem." For instance, Cristol said that field studies that show birds living in high-mercury areas have low reproductive success led to a hypothesis that mercury was to blame. "We can say that we think it's the mercury, but in the aviary we can dose birds with mercury, have a control group of birds that doesn't get mercury, and know for sure," he explained.